Jude is a psychotherapist in training and lifelong student of psychology and meditative traditions. He became obsessed with consciousness and eastern philosophy in his late teens and has been exploring ever since. At 21 he took after his parents by beginning to formally study Tibetan Buddhism, then went on to study Transpersonal Therapy, Gestalt Therapy, Existential-Integrative Psychotherapy, and a bunch of other weird stuff. 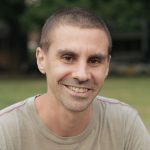 He’s been teaching meditation for 5 years, has been a content writer for the popular meditation app Calm, and works closely with Jeff Warren on various projects.